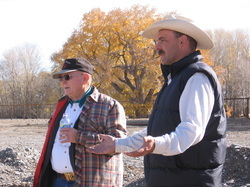 On October 23, 2007 the District hosted a feedlot tour for South Big Horn Conservation District citizens, local legislators, and NRCS personnel. Twenty-six participants were able to see first-hand some of the work local feedlot owners have completed to bring their facilities into EPA compliance. All three feedlots were funded with private dollars, 319 cost share monies, and NRCS EQIP or AMA dollars. Coble Brothers, west of Burlington was the first feedlot on the tour. That facility was nearly completed and ready for use--attendees were able to see the new open shed that was constructed, the water system installed, and pens constructed from pipe panels. The next stop was the Rocking J R feedlot which is located near the Coble Brothers facility. Participants were able to see this feedlot relocation project in the very beginning stages. The main focus at this facility was being able to view a unique type of watering system (see pictures below). The afternoon portion of the tour featured the recently relocated Russell Farms feedlot. This feedlot also showcased a watering system and pens that have been constructed with guard rail.